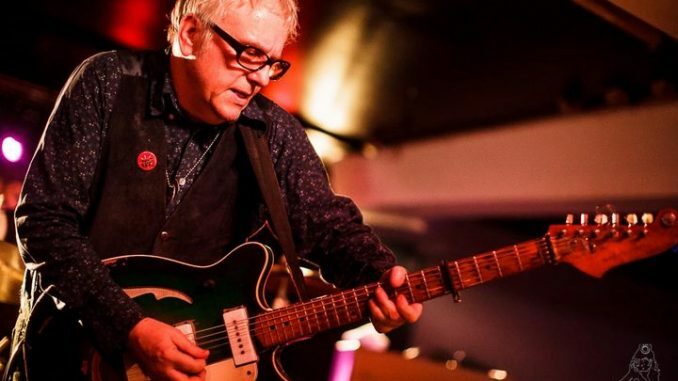 Wreckless Eric returns to Australia for the first time in 38 years and covers the whole wide world in this conversation. If you thought that twenty-six years was an inordinately long time to wait for John Prine to return to Australia, then the gap between Wreckless Eric tours must seem like an eternity. However, the singer is back in Australia after a mere 38 years. It’s difficult to imagine why Eric Goulden, who penned the insistent hit ‘Whole Wide World,’ hasn’t been back since then given the popularity of just that one song but that doesn’t mean he hasn’t been busy. Eric was an early Stiff Records signing, along with the likes of Elvis Costello and Nick Lowe, both of whom are also still going strong. But while his former label mates might have enjoyed success with major labels, Goulden has remained independent. After departing Stiff Records soon after his first Australian foray he went on to form the bands the Captains of Industry, the Len Bright Combo, and the Hitsville House band as well as recording his own solo albums and more recently writing and recording with his wife Amy Rigby. Eric has lived in upstate New York for the past seven years after more than a decade in France. “You’ve got Saugerties about ten miles down road and Woodstock is a bit further west,” explains Eric. “Woodstock’s a bit west or south west or something. Takes about 40 minutes to get there in a car. So how did he pick New York? How did he pick living in Catskills? “Suddenly we got serious about the idea of moving,” continues Eric, “but then we thought we’d better live somewhere that was easy to get to England, easy to get around where we knew people. I didn’t want to live in New York and we didn’t want to live in Philadelphia or somewhere and just about everywhere we looked we couldn’t afford anywhere. Everywhere was like a ghetto and eventually I found Catskill. I saw it on a map and I looked at the map of the town, I said, ‘This looks really great. Looks really cool. Let’s move to Catskill.’ And we did. “You can’t imagine it. I sold this house and got a green card and I don’t know how we did all this. I mean, we got a container and filled it with everything we owned and bought a house and it was kind of not derelict, but had been owned by hoarders and kind of filled it with junk and let the place go. And we kind of made it all better somehow. I mention to Eric that I had books such as A Year In Provence and always thought it would be a living hell. (For me, anyway). It’s a whole, wide world away from the London that saw his first hit record back in 1977. That one classic song has been covered by The Monkees, Green Day, The Replacements, The Proclaimers and others. Will Ferrell even sang it in a movie. But while you might be able to hang a career on it, Eric also has a new album out, Construction Time & Demolition, that he will be highlighting on his forthcoming tour. Eric says that after the Australian tour in 1980 he needed to take a break. Being on tour constantly caused him to reassess his life. Does he recall anything of that first tour here? I explain that this is the first question touring musicians get asked almost as son as they touch down here. “Oh right,” says Eric. “Obviously, I’ll work one up. I had about 40 years to do that.”I love that film, have you ever seen that documentary about The Easybeats? They’re coming from Scotland and they’re coming from Holland – like Harry Vanda’s from Holland and George Young’s from Scotland, and they’re talking about getting there and it was beautiful and there’s palm trees and stuff, but they’d never seen anything like it. They were on this train and the train went further out and the houses got smaller until there weren’t any houses anymore and there weren’t any palm trees and they was just kind of … and then suddenly there was these tin shacks. I tell Eric that I saw Nick Lowe, one of his former Stiff Record colleagues, recently in Austin, Texas and that while he plays his old ‘hits’ he makes sure he plays his newer songs as well. “Some people have a few songs and that’s what carried them through,” says Eric, “but it doesn’t really work. I’ve seen people who play the same old stuff and the edges are getting worn off it. I’ve been making records for 40 years, and I like to play stuff from all over my very long career, if you like. I don’t do nostalgia and I think it’s the death of everything. It doesn’t do anyone any favours. But I don’t think you can just kind of ignore your past. You have to sort of look at it and try and bring something to it. I do all kinds of things. “I sometimes refuse to play some tune because it doesn’t speak to me anymore. I think if it doesn’t say anything for me, I’m not being honest if I do it. So you better listen to the record or get someone else to do it who has the belief in it. “But sometimes I also look at what it is that people are getting from it and try to find that again. Sometimes that works and sometimes I mess around with the tunes and play something in a strange tuning and suddenly it develops something. I do constantly look through my catalogue and try to find things that every tour I haven’t played and find a way to do it. Obviously, there are things like ‘Whole Wide World’ or ‘Reconnez Cherie’ is a very popular thing that I pretty well always play. I mean, like ‘Whole Wide World’, yes I always play that because it just got bigger than me, really. It’s like this big hit, really. “If I didn’t [play it ] it would be kind of churlish and I find that other people’s enthusiasm for it can buoy it up even if I’m feeling kind like, ‘I don’t know what it means anymore.’ I don’t know, it’s a thrill. It’s like a hit and it’s like a dream. Like it’s every kid’s dream to have a hit. And then when you have a hit you can’t really go, ‘I don’t know. I don’t want to play that.’ I mean, that just makes you strange, doesn’t it? And not in a good way! This time around Eric is on a solo tour of Australia – just him and his guitars – and he says he’ll play a selection of material from across his career (although he is still recording albums with his latest one being Construction Time & Demolition). Wreckless Eric’s Australian tour starts on November 11 in Melbourne. Check the Rhythms Gig Guide online for details. (An edited version of the above feature appeared in the November/December edition of Rhythms).